Preheat oven to 350 degrees. In a large bowl, whisk together sugar, soy yogurt, and vanilla. In another bowl, whisk together flour, cocoa, baking powder, and salt. In an 8 or 9 inch cast iron skillet, bring margarine and nondairy milk to a simmer over medium heat. Add chocolate; reduce to medium-low. Cook, stirring constantly, until chocolate has melted, about 1 minute. Remove from heat, and let cool 5 minutes. Add chocolate mixture to sugar mixture, whisking until blended (reserve skillet). Fold in flour mixture. Mix in pecans and cranberries. Pour batter into skillet. Bake until a toothpick inserted in center comes out clean, about 40 minutes. Serve from skillet, warm or at room temperature. i hear ya, Jes – it’s cold, rainy and just plain crappy here, too. meh. tonight i roasted up a spaghetti squash for dinner just so i could have the oven open afterwards to warm up the kitchen some more. ah ha ha! your cranberry pecan brownies look awesome! my brother introduced me to the cranberry + pecan flavor combination – and ever since he did it’s been one of my favorites. and of course, i love me some chocolate goodness…. so naturally, cranberries + pecans + chocolate = hellz yeah! stay warm! If it didn’t require a trip through the nastiness to buy pecans and dried cranberries, I’d SO be baking this tonight. You picked a bad winter to move to Virginia; it’s not usually THIS obnoxiously bad all winter! (Actually it was nice up here all week until today. Have you noticed the weather’s been worse on and near the weekends?) The last few winters have been mild. This one is lame. It’s cold here too, but at least dry. But I feel equally entitelt to eat those wonderful brownies! Oh, love this! 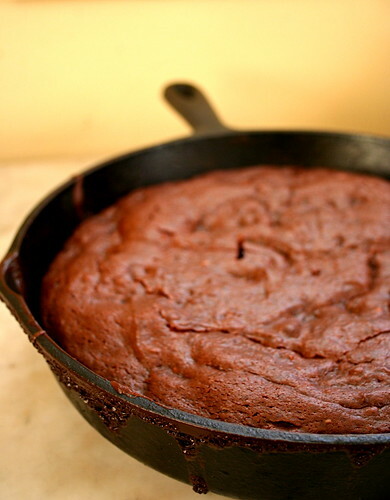 Such a novel idea to make brownies in a skillet… Sounds like a fantastic, warm chocolate delight. Cold and rainy here, too! I may just have to bust out the baking pan. Oh man, warm chocolate definitely helps a cold day. I just got a cast iron skillet for Christmas and haven’t tried baking in it yet. I will have to try that out soon. They sound yummy! We don’t have a skillet any more, though, and it’s going to be way colder than merely 32°F here on Monday. It’s 32°F here right this minute, and it’s 1 p.m.! Cooking always makes me feel better when it’s cold and rainy. Warms the place up and I have something yummy to eat. Those skillet brownies look amazing! I’ll be so glad when it’s springtime! I agree chocolate is the best comfort food and I have been craving chocolate cake like crazy in this weather. These skillet brownies look perfect! You’re right, Jes, there is pure comfort in chocolate at times. I never made brownies in a skillet, so I will have to try these. They look scrumptious! Chocolate is the best defense against anything! Definitely a cure-all in my book. These look fantastic. Such a unique recipe and what a creative way to cook them. It’s always good not to murder one’s mother. Chocolate is the best remedy for everything! What a gorgeous shot! The brownie top looks glossy and crusty, just like it should be. How many layers of socks do you have on? I have a regular knee-length pair, a short ankle-length knitted pair, and my warm calf-length booty slippers. Who wins?